Motorists traveling along Roberds Lake Boulevard over the next week can watch as a walnut stump is transformed into a little girl lost from a home on the lake 73 years ago, who was never found. Saturday, Curtis Ingvoldstad of St. Paul, an artist who turned to chain saws and grinders for his wood sculpture tools, started the piece Saturday. The piece has been commissioned by Barbara and Steve Sells, 18221 Roberds Lake Blvd., who live just across the street from the lake. "This project got its start because I found the story about the missing girl in Robert Misgen's history of Roberds Lake, titled 'Lake of Chedeweta.' We had to take down the top of the walnut tree last year. It's likely old enough to have been here back when 2-year-old Dawn Lenore Mosher went missing," Barbara Sell said. So, she and her husband thought of turning the walnut stump into a stature in memory of the little girl. "This has really been a process that evolved over the past winter," Barbara Sell said. She sent a letter to families in the area with the name of Mosher, and also to Waite, the mother's maiden name, but found no one related who could help her gather information. From Robert Misgen, Sell acquired copies of newspaper articles about the search for the 2-year-old, reported missing by her father, Harold Mosher, who lives on a cottage on the north side of the lake. A posse search the wooded areas around the lake for the girl, and the lake was dredged several times, but no body was found. Mosher, separated from his wife at the time, was taken into custody for questioning, as was his girlfriend. But neither was ever charged, Sell said, because they never found a body or evidence that could connect them to Dawn Lenore's disappearance. "It's a mystery to this day what happened to the little girl. So, I thought a statue of her, created from the walnut stump, would not only give us some yard art, but provide a historic sculpture for the entire Roberds Lake community to enjoy," Sell said. One newspaper article described Dawn Lenore Mosher as having light hair, dark brown eyes, and being an exceptionally attractive child. Sell could not locate any picture of the girl. Ingvoldstad had to use his imagination, not only as to what Dawn Lenore might have looked like, but how to render her using the stump. He drew an initial plan. "However, as I go about this, the wood itself will likely come into play in my sculpture," Ingvoldstad said. "It's going to take a while to complete, so people coming and going from the land will be able to watch my progress." 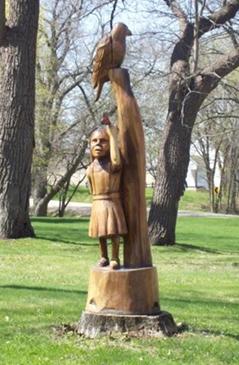 He has a degree in studio art from the University of Minnesota, and operates Curtis' Wood Sculpture in St. Paul.